Hello, good morning! It's Monday and time for more masculine inspiration! Yet again, I'm taking my own inspiration from the lovely ladies at the Less is More site, whose challenge this week is to produce a card with a touch of red. Look at the beautiful perforated detail on the edge of the Top Note die! I love the curves of this die - it's great for adding movement to a card. The red parts of the motorbike are highlighted with Crystal Effects although I couldn't seem to capture that on camera - it looks really glossy in real life! 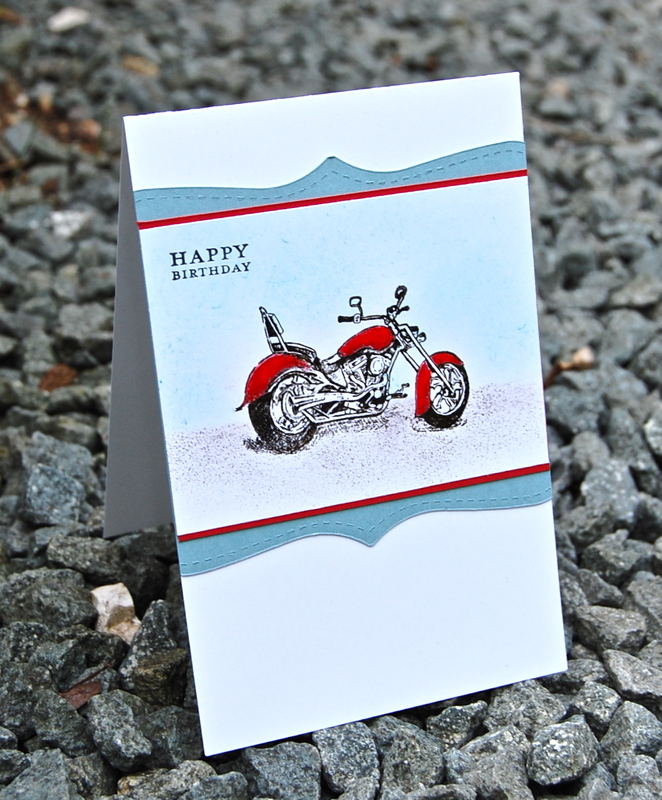 Stamp the motorcycle onto a 9.5cm x 7cm piece of Whisper White card stock using Basic Black ink. Sprinkle quickly with clear embossing powder and heat with the heat gun. Colour the mud guards and petrol tank of the motorbike with a Real Red marker. Mask above the centre of the wheels with a piece of paper and sponge a ground on the bottom of the card stock with Early Espresso ink, using a rough 'massage' sponge to create texture. Hold the same piece of paper over the ground and sponge a sky with Bashful Blue ink, using a smooth piece of sponge. Stamp a sentiment in the corner with Basic Black ink. Glue the panel onto a 9.5cm x 7.5cm piece of Real Red card stock. Mount this onto Baja Breeze card stock cut using the Top Note die whisked through the Big Shot. Trim the sides of the Top Note shape flush with the sides of the motorbike panel. Cut 9.5cm off the length of an A4 sheet of Whisper White card stock. Score and fold in half to make a card base. Attach the focal panel to the card front. Add Crystal Effects to the red parts of the motorbike and leave to dry. I hope you've all had a good weekend. Many of you may have been celebrating Mother's day - as I was! My three lovely children spoilt me with cards, chocolate and flowers - and so many cups of tea I was visiting the loo most of the day! It is one of my favourite days in the year as I get to go to Mumland (as my daughter puts it!) I look at the miracle that is my family and can't imagine what on earth I ever did to deserve them. By the way, thank you so much to everyone that left a comment about my ten-year-old son's card last week. He was so excited when I showed them to him and turned to me with wide eyes and said "Mummy! I'm a star!" And the thing is, it's true - he is! This stamp looks fabulous... something I may just have to purchase in time! Great to see you again, I look forward to seeing what you produce each week! What a great stamp for your Masculine Monday. I love your textured ground as well. cant wait to see what you do tomorrow??? Fabulous Vicky. Your masculine cards are always inspirational. Im sure your family think the same of you too! A fantastic card.....really great for guy. As a closet biker I love this card - mine was big and black though! Love this image, lovely card!! I love your motorcycle and the Top Note definitely gives it an edge! Great job! Gorgeous card, love that stamp. Glad your enjoying your bigshot, have you tried cutting chipboard or material on it yet??? That motorcycle stamp seems to be a real hit! I love what you've done with it! great to see SU demos on this challenge. Why is it that I find it nearly impossibly to pass a post of yours without commenting?!? You are a master at the masculine cards... and at the whole less is more concept, too. 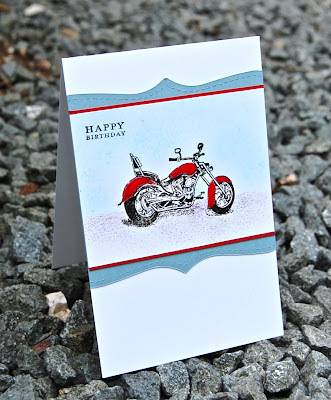 This card is perfect... how you've used the Top Note die horizontally on a vertical card makes it a nice frame and not girly at all... the crystal effects on the motorcylce is the perfect touch to make the card magnificent.